The term ‘scaling’ is increasingly popular in international development efforts, as it has the connotation of providing a real solution for large numbers of people. However, the popularity of the term is not necessarily matched with a sufficient degree of conceptual clarity, depth of approaches and underpinning of success claims. Good literature and papers on scaling are scarce. This publication, Explorations 04, seeks to unpack the concept of scaling and create conceptual clarity by presenting an overview of the terms, frameworks, and models used in relation to scaling. 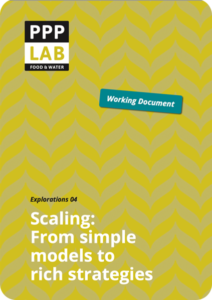 In doing so, we hope to contribute to the understanding of the specific role of PPPs in scaling and to support practitioners in getting to grips with different scaling approaches. Based on a literature study and interviews with case owners and thought leaders, this publication collects various concepts, frameworks, models, and approaches and presents an overview and synthesis of these. While the cases studied are from the water and agriculture sectors, the concepts and approaches are of wider relevance.